Far Sight draws Far Sight. I think for Rogue this would be pretty good. Either high curve control or combo decks would benefit. I'd never run this in any (current) rogue decks. Rogue carries too many low-cost spells to risk this card. I suppose. It does have pretty sick combo potential with Preparation + Gadgetzan though. Far Sight into Farsight into Manatide the dream! what happens if I use this and then draw say a warrior's mine or an ambush? does the second drawn card cost less or would the ambush/mine negate the lowered cost for the next card? burrowing mine and ambushes are also cards themselves, so they will consume the -3 mana bonus. Why isn't this 2 mana or "cost (4) less"?? Horrible card. Its "0 mana draw a card" at best. Might as well putt in a good 3 mana card. The only reason I can Imagine is that you are able to put a bigdrop out early, but you waist tempo doing it. Id rather play Spider Tank -> Piloted shredder, than have a chance at getting turn three nothing, turn four dr boom. If you draw something cheep like a zombie chow you waist 2 mana AND a cardslot in your deck. "Wasting a card slot" is not actually a problem when the card draws a replacement for itself. What you're actually "wasting" is "# of cards remaining in your deck", which isn't actually a resource that matters in any game that isn't against a fatigue deck. Imagine if there was a card that was 0 mana, "Draw a card". Every single deck in the game would run it, because all it does it make your deck smaller, and thus more consistent. 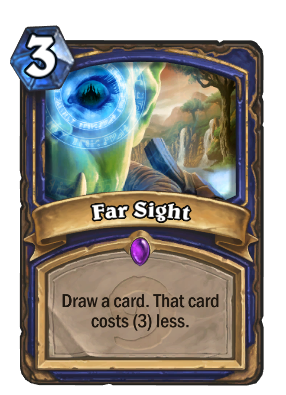 Far Sight has some advantages over that hypothetical card (It lets you do more in one turn, potentially. It lets you play a big card sooner before your opponent has an adequate response, potentially), but the risk of hitting a 1- or 2-drop is too severe, and if you can't play it as soon as you draw it (either because you don't have enough mana, or can't risk not playing for tempo that turn), it effectively reduces your hand size and delays informations about your draws until you can. Unstable Portal gets to give you an overall discount because it gives you a totally random card, as opposed to Far Sight giving you a card that you intentionally put in your deck. But then Mages also get a number of cards that synergize with playing spells, letting Unstable Portal see more play. Great explanation, also didn't realize why cards like Arcane Intellect are so important. So if I have 4 mana, I use 3 mana to play this card, then I draw a 4 mana card, then that card becomes 1 mana only. I have 1 mana left so I can play that card. But I have 4 mana already, so I would've played that card anyway if I didn't put this card in my deck so I would've drawed that 4 mana card instead of this card. No , you would draw the card you put in place of this card. It's a free card draw and the only downside is you might draw something lower than 3. It's not the best but it's not useless. Except it cost you a draw to draw Far Sight in the first place. It's a card that fits in control decks. It might be used to reduce the cost of a big minion , so you can play it next turn. But control shaman isnt a thing so this card wasnt used that much. In that particular case, the only thing Far Sight did was make your deck smaller, and thus more consistent. Which is great! The problem is when you hit a 1- or 2-drop with it. Or when you hit a giant minion with it on a turn when it was more important to play for tempo.